Every now and then I receive a book recommendation that completely surprises me (in a good way). 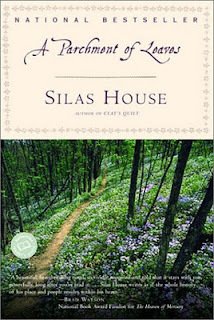 A Parchment of Leaves by Silas House is one such book. I belong to a local book group that meets at the Charleston Town Center Mall on the last Wednesday of each month in the Community Room at Panera Bread Company (if you're in the Kanawha County area please join us), and this was the book chosen for November. The story is set in eastern Kentucky during the early 1900s and centers on a young Cherokee woman and her experiences with her non-Cherokee husband and his family. Although there is racism evident against Cherokees, this is not the heart of this story. Vine is a beautiful young woman that becomes enamored with Saul Sullivan. Saul is just as entranced and in love with Vine and the two marry. Vine accompanies her husband to his family's land and leaves all that she has known behind. The life that Saul and Vine lead is not considered a hard-scrabble life, but they do have to work hard. They must build their own home, which they do with the assistance of neighbors and family. They grow most of the vegetables and must slaughter chickens and hogs for meat. Vine washes their clothes on rocks at the nearby creek and they obviously don't have indoor plumbing, running water or even electricity. Vine and Saul don't miss these things simply because they've never had them and it isn't expected. Saul works hard at the local mill and Vine works equally as hard keeping house. Eventually Vine gets pregnant and gives birth to a little girl they name Birdy. As World War I begins, Saul wants to help with the war effort and volunteers to work in the next county. This job means that he'll be gone for long periods of time. Vine gets along well with her mother-in-law and loves her new family. But she is also wary of her brother-in-law Aaron. He has never openly done anything, but he simply always seems to be underfoot and watching her, even when she's out in the woods or walking with friends. She is extremely cautious about Aaron but Saul thinks he's harmless. Aaron isn't exactly irresponsible, but he's never held down a job and seems to want to experience a hundred different jobs all at once. After some time Aaron leaves the family and is gone for months before returning with a wife - a young and pregnant wife. Aaron's marriage gives Vine hope that he's no longer attracted to her, until it is pointed out that his wife, Aidia, bears a strong resemblance to her. I could give you more details about the story, but I'll stop here. It is sufficient for me to note that this is an excellent portrayal of rural Appalachian life during the early 1900s. Mr. House has crafted a story that is captivating and utterly believable. This isn't a glossed-over, rose-colored view of rural life, all of the hassles, trials and tribulations are deftly revealed. I become so engrossed in the story that I had to finish it in one sitting, even staying up late to do so. Saul is initially the typical strong but silent man that openly loves his family. He becomes more outgoing as the story evolves but remains openly loving of his family. Vine isn't a traditional housewife and mother although she deals with all of the household chores with ease. Their marriage has its share of ups and downs, usually as a result of outside forces. The story is different and the voice of Vine is unique, such that A Parchment of Leaves had me in a hurry to collect more literary fiction by Mr. House.